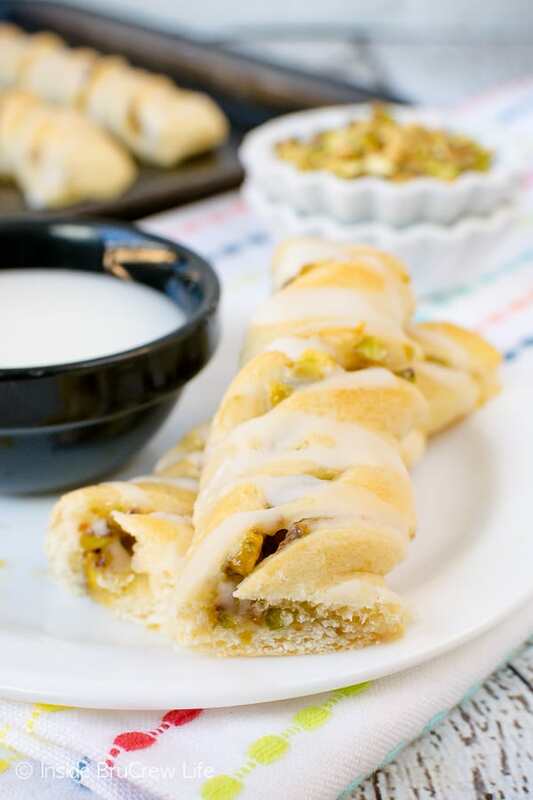 Waking up to a batch of the Lemon Pistachio Crescent Twist is a very good idea. No one has to know that you made breakfast the day before. 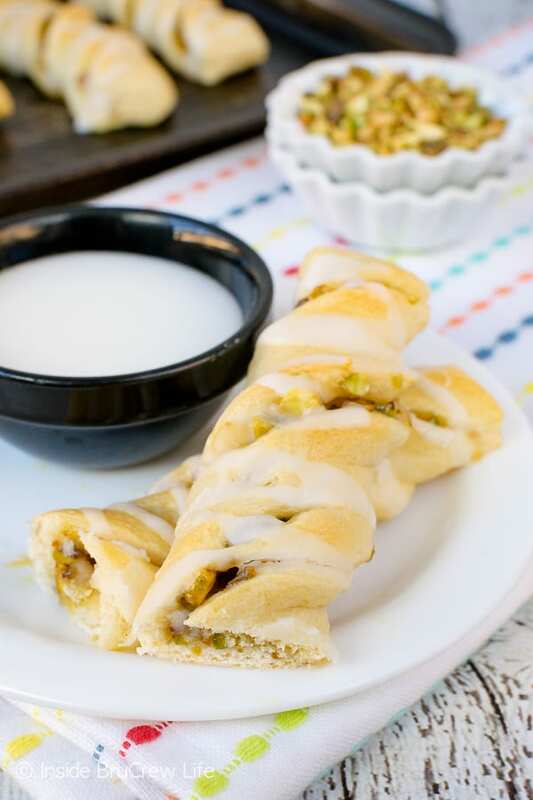 I love finding fun ways to change up breakfast treats. If I’m being honest, I actually love finding ways to make breakfast the day before because we all know that I’m not a morning person. At all. 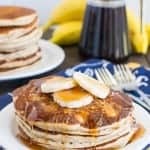 Making Banana Pancakes, muffins, or pastries have to happen the day before, or they won’t happen at all. Well, unless it’s Saturday when making breakfast after 10 am is acceptable. Every once in a while our kids can convince me that they need hot fresh pancakes first thing in the morning. Usually that only happens if it is their birthday though. 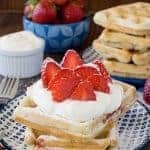 I’m all about making a big batch of pancakes or Homemade Strawberry Waffles the day or night before and then freezing them for the rest of the week. There is nothing wrong with pulling out the toaster, right? Another thing I’m fond of doing is raiding our fridge and pantry for miscellaneous ingredients that need to be used up. I’m notorious for over buying different things that I think I will use in a timely fashion. But in reality they get tossed into the pantry bins until further notice. 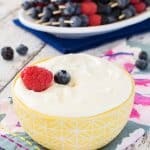 A few weeks ago, I made a batch of this Lemon Cream Fruit Dip, and I put the leftover lemon curd into our fridge hoping I would find a way to use it up. Or until I grab a spoon and finished it off. This week I decided it was time to create something that the kids could eat for breakfast using ingredients we had on hand. The jar of lemon curd was the first thing I pulled out. I found a few cans of crescent rolls while I was rummaging in the fridge too. 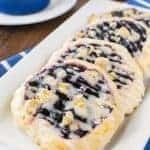 I tend to buy more than I need of these because you never know when you might want a Blueberry Cheesecake Danish for an afternoon snack. Right away I knew a fun little twist treat was the answer to my baking challenge. But since this was only using up two ingredients I walked over and opened up the pantry doors. There are always bags of things that need to be used up in there. My first thought was to add shredded coconut, but then I saw the bag of pistachios sitting there all lonely like. I had bought the bag to use in salads, and then yes you guessed it, I forgot about making that salad. 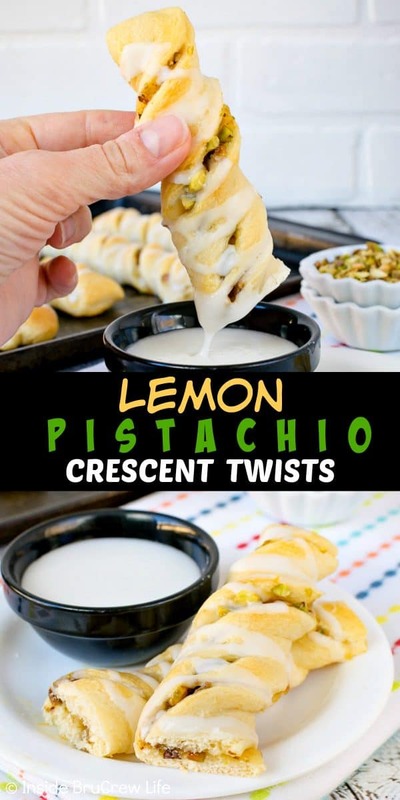 Since lemon and pistachio is a great flavor combo, I knew they would work great in my little crescent twists. 20 minutes later a pan of hot twists was sitting on our counter just waiting to be dunked in some gooey glaze. 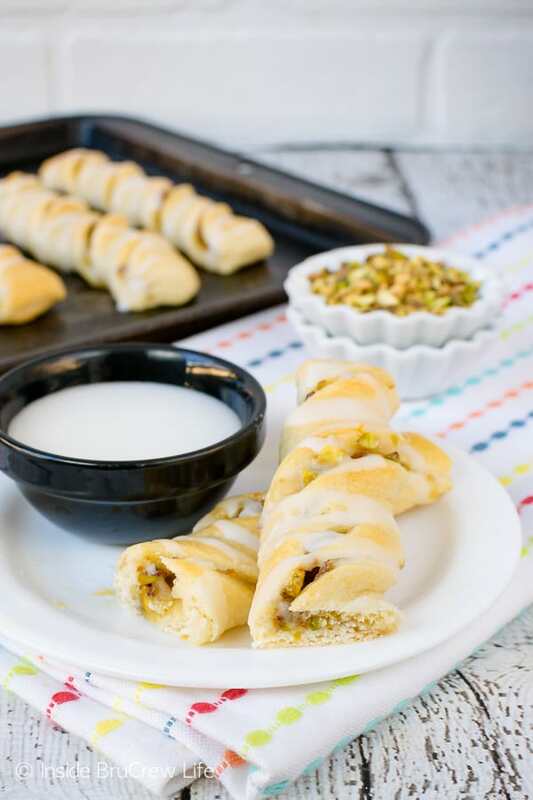 Unroll your can of crescent rolls and press all the seams together. If you can find the dough sheets, buy those and save some time. Then cut the dough into two even rectangles. Spread the lemon curd on one rectangle and sprinkle with chopped up pistachios. Place the second dough rectangle on top and press the edges together. Cut the filled rectangle into 8 strips. 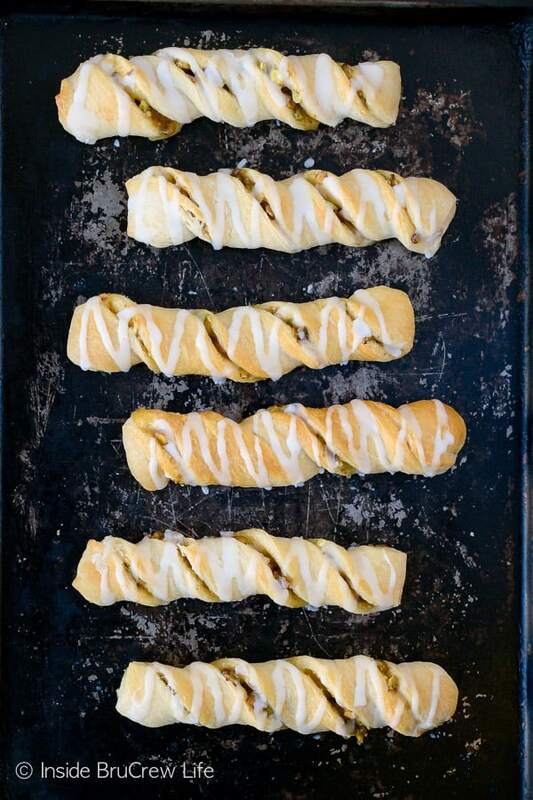 Twist each one two times and place on your baking sheet. 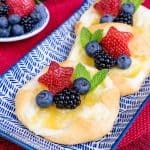 Bake and cool, then drizzle with an easy glaze. 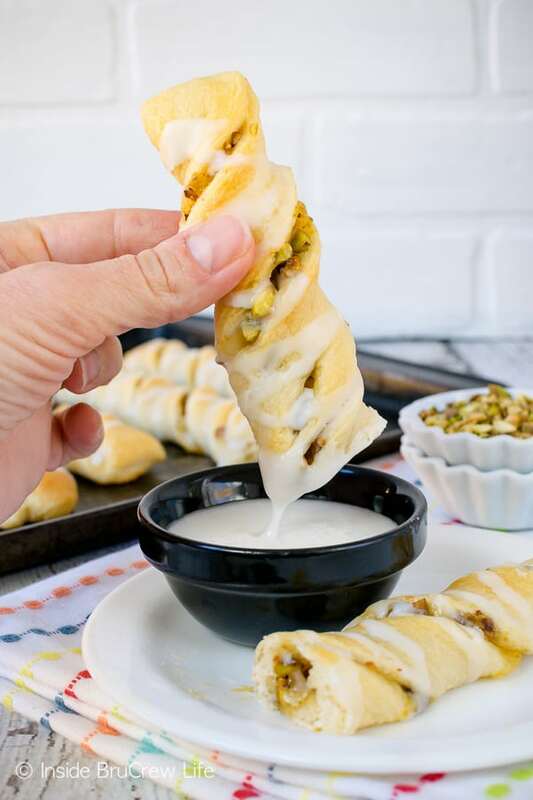 Use the extra glaze to dip your twist into if you like. 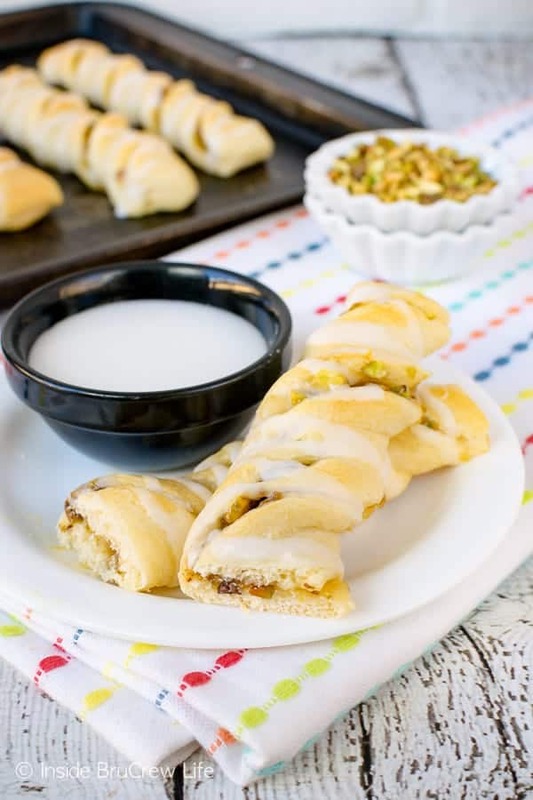 Make sure to head over to Food Fanatic where I am a breakfast contributor to print the Lemon Pistachio Crescent Twists recipe. Keep a batch of these Milk and Cereal Breakfast Popsicles in your freezer for quick and easy summer breakfasts. Throw all the ingredients for this Triple Berry Orange Smoothie into the blender right before you walk out the door. 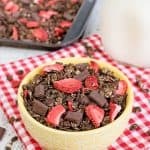 These Muffin Tin Breakfast Frittatas are perfect for on the go mornings and are easy to customize.